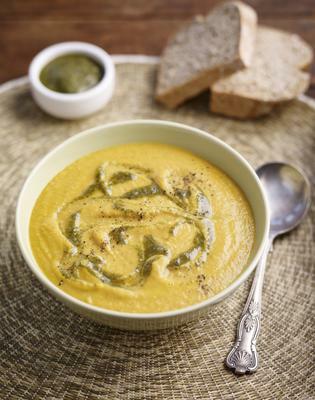 A sweet and warming winter soup, although carrots are in season more or less year round! Heat the oil in a large saucepan and gently cook the onion for 5-8 minutes until it starts to soften. Add the garlic, carrots and ginger and stir well. Cook for two minutes then add the stock. Bring to a simmer, season and cook for 15 minutes, with the lid on, until the carrots are soft. Stir in the nut butter then set aside to cool a little. While the soup is cooking make the pesto. Toast the seeds in a dry frying pan until they begin to pop. Whizz the toasted seeds, parmesan, garlic, carrot tops, nut butter, lemon zest and juice along with half of the oil, in a food processor until you have a thick paste. As its whizzing, add more oil until it becomes a drizzling consistency. Blend the soup until smooth, add more stock if it’s too thick and check the seasoning. Reheat then ladle the soup into bowls and drizzle with pesto.